Keep on the lookout for our upcoming season schedule! Want to get your skate on during the off season? Come out to Rec-O-Rama on Wednesday nights in Brunswick! Be sure to check the Rec Facebook page @https://www.facebook.com/recOramarollerderby/ for schedule details. There are a few Wednesdays during the holidays (think the day before Thanksgiving) when Rec doesn’t happen. Things keep rolling along for the Cleveland Guardians. 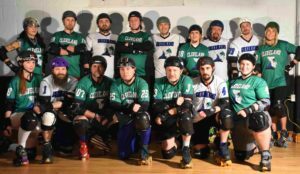 Last weekend, we had the privilege of hosting the Pittsburgh Blue Streaks and Detroit Men’s Roller Derby for a triple header! Looking forward to seeing those guys again, soon, on the roller rink!